Are you facing some wet spots or water leakage in your Commercial Building(s), Rooms, Offices, Condos or Private Houses? If the answer is Yes - it calls for our Brick Pointing Services. 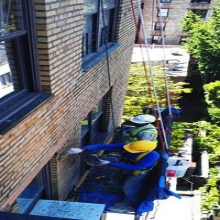 Our experts will come to visit your site for inspection and provide you with a FREE OF COST ESTIMATE FOR BRICK POINTING and other Brick Work.